Advocacy by and for adults with Down syndrome is based on the belief that all citizens have the same rights and responsibilities and potential for growth. It is recognised that there is a need to combat the exclusion and discrimination experienced by adults with Down syndrome through enabling them to access their human and legal rights. 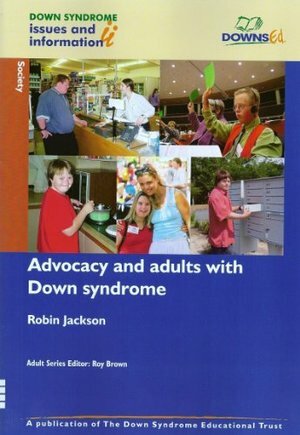 The contention of this book is that the quality of life of an adult with Down syndrome can be positively enhanced where advocacy is able to promote: personal autonomy and empowerment; self-esteem, self-confidence and self-respect; the development of socially valued relationships; choice of living and other related domestic arrangements; engagement in a range of appropriate educational, social and leisure activities; physical, mental and spiritual well-being; social inclusion; personal safety; protection from discrimination, neglect, maltreatment and abuse; and dignity through participation in acceptable forms of risk taking. The book seeks to define advocacy, explore its origins and describe the various forms of advocacy that are on offer. A number of vignettes are presented in order to illustrate how different forms of advocacy can benefit adults with Down syndrome. Ways in which advocacy can assist people with communication difficulties are examined. Strategies that parents and relatives of adults with Down syndrome can usefully employ when confronted by obstructive agencies are examined. The main steps in setting up an advocacy scheme are outlined. It is accepted that advocacy has the potential to transform the quality of life of adults with Down syndrome but that such empowerment can only be realised through strong, independent, informed and expert representation. A number of ideological, financial and operational factors are identified which may adversely affect the future growth and development of advocacy. The book highlights some of the ideological divisions within the advocacy movement; the most profound of which surrounds the merits or otherwise of developing a more professionalised form of advocacy. Attention is also drawn to the critical importance of advocacy schemes operating independently of any funding agency, for without operational independence, advocacy schemes will lack integrity, authority and influence. The book fully recognises that not all adults with Down syndrome need the kind of support that advocacy schemes can offer. Indeed some of the most effective advocacy is provided by adults with Down syndrome either representing themselves or others.